You must be logged in to pay for Premium Member Account. If you don't have an account, please register here and try again. After the payment, it can take from 5 minutes to several hours to process your payment. Please be patient, we will send you a notification by e-mail when it will be done. my email *******@yahoo.com ?? how at audio club??? my user at audio club??? Please check your email beren31@gmail.com. This site saved my brain and wallet. Guys (Admins) if you need any help with making a better filters for better search copy and paste links and more, get in touch I’m more then happy to help around. Welcome PieroTheBarber! Now you are premium member, please check your email. Hi, we will upload it as soon as we have it. What does that mean? It doesn’t seem to make sense. Previous users have mentioned the same, above. Could you please clarify this? Hi, It’s email you use to register username at Audio Club. heyyy whats the paypal account that i should make the payment? the premiun page doesn’t lead to the paypal account, and i cant find the account anywhere on the site!! Fill in that from and Click on “SUBMIT”. You will be redirected to Paypal. Hey i’ve already bought the premium, can u turn me a member?? Hi how long will this take? Welcome Ian Dior! You are premium member now. Please check your email. How much is it for premium ??? Welcome paperwork media! You are premium member now. Please check your email. It may be in SPAM. I just paid for premium… just hoping I dont have to wait too long to be verified! Welcome BabylonBlack! You are premium member now. Please check your email. It may be in SPAM. helle i m premium number , but when i want download , im redirected on hidlinkd.in and it said you must be a premium number to download ? what can i do please ? 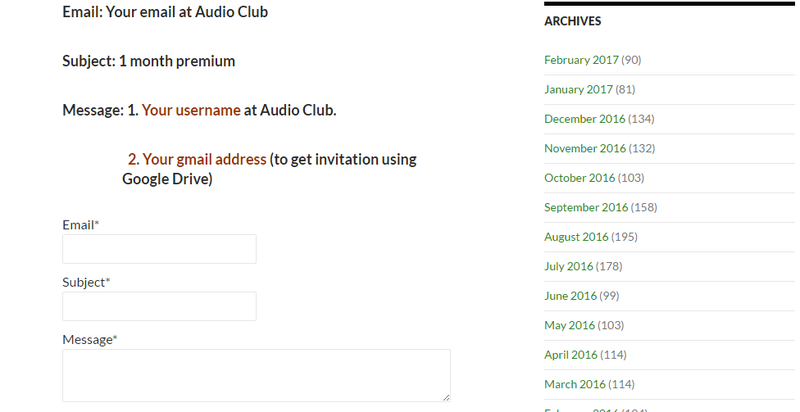 Hi, please use username and password I sent you at the first time you become premium member at Audio Club to login at hidelinks. Then you can see download link at hidelinks. Whenever I try to register it says the capture didn’t verify but these any capture. Could any guide me through it? You’re still premium user. Please check again. FTP password will be changed daily. Hi Just paid 1 month but forgot to leave my Gmail account. What to do? Welcome Bo Richter Larsen! You are premium member now. Please check your email. It may be in SPAM. Hi there, I’ve paid for my premium account. Roughly how long for my account to be updated to premium status? Welcome jayraow! You are premium member now. Please check your email. It may be in SPAM. Hi, i just updated my premium account, can you please check it? Thank you! Welcome tayfun! You are premium member now. Please check your email. It may be in SPAM. Hey, if I have a different paypal email than my email I use here, will you still process my email using the one here or the one I use to pay you for? Please advice! Hi, different paypal email is still ok.
Hi, I just paid for my subscription, has it been processed? Welcome Vick Tramp! You are premium member now. Please check your email. It may be in SPAM. Just paid! Waiting for your confirmation. Thanks! Welcome massimo lavelle! You are premium member now. Please check your email. It may be in SPAM. Ive paid! Waiting for your confirmation. Thanks! Welcome Chris Lorenz! You are premium member now. Please check your email. It may be in SPAM. Welcome Simon Bailey! You are premium member now. Please check your email. It may be in SPAM. Welcome Rachel White! You are premium member now. Please check your email. It may be in SPAM. Hey, made payment and waiting for confirmation. Welcome James Crowley! You are premium member now. Please check your email. It may be in SPAM. Welcome Saboteur06! You are premium member now. Please check your email. It may be in SPAM. Made a payment. Just waiting for confirmation. Welcome panspOrmia! You are premium member now. Please check your email. It may be in SPAM. Hi i just made a payment. Waiting on the confirmation. Thanks. Welcome Mitchell Mouratov! You are premium member now. Please check your email. It may be in SPAM. it’s ok for me ! Welcome cristian moioi! You are premium member now. Please check your email. It may be in SPAM. Just made the payement and waiting on your mail bro. Welcome ma rooz! You are premium member now. Please check your email. It may be in SPAM. Just made payment waiting on the email. Thanks bro! Just paid waiting on the email! Awesome site. Welcome s win! You are premium member now. Please check your email. It may be in SPAM. Hi, I made the payment. Waiting for the email, thank you. Welcome Willian 83! You are premium member now. Please check your email. It may be in SPAM. Hi, Longu, made the payment so i’m back as premium member. Waiting for the email, thank you! Welcome cristiancomes! You are premium member now. Please check your email. It may be in SPAM. I finished my premium payment 10 minutes ago. But your mail has not arrived yet. Welcome Jiwoon Yang! You are premium member now. Please check your email. It may be in SPAM. Welcome Senso Caesar! You are premium member now. Please check your email. It may be in SPAM. Welcome An Va! You are premium member now. Please check your email. It may be in SPAM. Hi,. Is there a daily LIMITATION on downloads from this site ??? Hello. I just paid for premium account. Thanks. Welcome Dumitru Sebasco! You are premium member now. Please check your email. It may be in SPAM. How to get 3months premium…? Welcome Damere Dorsey! You are premium member now. Please check your email. It may be in SPAM. hi,I made the payment few hours ago. Waiting for the email, thank you! Welcome dodo nppa! You are premium member now. Please check your email. It may be in SPAM. Paid for it few hours ago, waiting for the premium! Welcome Pablo Alexandro! You are premium member now. Please check your email. It may be in SPAM. How should I pay to become premium? Welcome phillip mateo! You are premium member now. Please check your email. It may be in SPAM. Welcome fili blood! You are premium member now. Please check your email. It may be in SPAM. Well, I just hope it doesn’t take forever to get activated. Most sites have an automation in place that gives you access info as soon as payment is received. hi sent payment for premium account. Welcome mix tapes! You are premium member now. Please check your email. It may be in SPAM.